Dressing up in costumes is a year round thing in our house. We love to attend local renaissance faires, festivals and even dress up for holiday events at our local theme parks, but we especially love when it comes to the Halloween season. We start celebrating in September all the way up to the last day in October. Lucky for us there are tons of haunts, events and Dia De Los Muertos celebrations in our area so we get some serious use from our costumes. This is why we love Chasing Fireflies! Not only do they carry a huge selection of costumes that are unique and very well made, they also offer some HUGE discounts throughout the year. With a little planning and preparation you will get that perfect costume or costumes in our case, that will be sure to get lots of compliments and hold up to some serious wear beyond one Halloween! This years costume Punk Devil with Chasing Fireflies wings, pitch fork and tights. All we added were our own boots! Perfect fit! This costume has a back zipper and a tad bit of give. My little partner in crime just turned 11 and each year her costume ideas mature. For us it's all about the theme! We work together to decide what's appropriate for her personality, her age and body type as well as the particular event we are attending to find that perfect costume! Here are some other ways to nail down the perfect costume for your family. Sizing: Always check the costumes sizing and measure! Chasing Fireflies sizing is spot and sometimes even run a tad on the bigger side. We have never had to return a costume for sizing which is a plus. Al La Cart: The costumes are very well made, looking to invest in just the costume, feel free to be inspired by their accessories by adding your own or using some of theirs, either way you can create your own individual look. Quality: I can't say enough about the quality. All of the costumes we have are still in perfect condition even after several wears. Cost: These are not your local party store costumes. Made very well they last beyond what the others do and can serve for several occasions in some cases. Think of themed Birthdays or dress up parties to get even more bang for your buck. Sales: They have some amazing sale throughout the year, up to 80% at times! Not Just for Halloween: Offering special occasion clothing, customized items and everyday clothing, it’s always a great resource for quality items. Last year we did a Disney Cruise during Halloween and ordered this Skeleton Princess costume. We added our own hat that had a Jack Skellington theme to it which matched perfectly! The costume was so pretty on it’s own we really didn’t need to add anything further but they do have some seriously cute accessories on their site. When Chasing Fireflies says Ultimate, they really mean it! I have shopped the “higher end” costumes offered at Disneyland within their Bippity Boppity Boutique and though they are very lovely they run about twice as much as the ones offered at Chasing Fireflies which are licensed Disney dresses! So here is another example of saving big by planning. Honestly I like the ones at Chasing Fireflies better and if you are not a fan of glitter, they don’t use a lot like the Disney Store ones. Here we didn’t need to add anything, the dress is stunning on it’s own. As you can see we have quite the collection of Chasing Fireflies costumes. 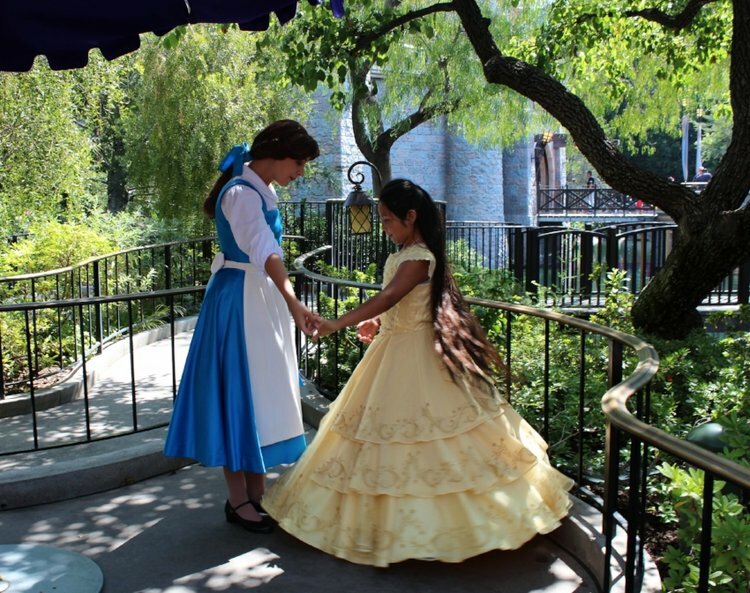 When Disney announced their new princess Elena of Avalor was coming to the Disneyland Resort, I was on a mission to find THE best dress for my daughter to wear to meet Elena which was also during her birthday month! Talk about a perfect match to the original! So many little girls in the park that day were calling out to my daughter, “Elena!” ‘Look, it’s Elena!”This Ultimate Collection Disney Elena of Avalor Costume is the most stunning one I have seen on the market! The details, fabrics and the fit…. perfection! My girl would rush home from school after it arrived, put it on and just watch T.V in it. See ALL the beautiful details HERE. Here’s another perfect example of picking out a costume and making it your own! We ordered the Ultimate Wonder Woman Costume and added our own wrist bands, head band and boots to create my girls look. ( you can see we used the boots above for the Punk Devil costume too). My top reason for ordering from Chasing Fireflies is consistency of quality and they are always coming out with new and relevant options that are age appropriate while checking off all my little fashionistas boxes! I would suggest getting a head start on your shopping now to insure the costume your are interested in is in stock and arrives on time! New Customers!!! Sign up today and get a 15% off Promo Code by email to use on your next purchase and be notified when sales are happening. Need costumes? They're 25% off, 2 days ONLY! Use code CF49410 at checkout! Costume Photo Contest! The three photos that earn the most votes will win an eGift Card for $500, $400 or $250, but everyone who votes will be entered into our second-chance drawing to win an eGift Card in one of those amounts, too! Click on the picture to get all the details! We love Chasing Fireflies! They carry a huge selection of unique and well made costumes and offer some HUGE discounts throughout the year. Enjoy limited time frights, fun and food when Mickey’s Halloween Party returns to the Disneyland resort select nights September 19 through October 31, 2018. Get over to knott's Berry Farm for their fun kids event, Knott's Spooky Farm, runs weekends thru October 29 and Halloween day. Did you hear? DCA is now a special mix-in to Mickey's Halloween Party at Disneyland. Get all the info and enter the giveaway for some DCA themed treats! A visit to the Happiest Place on Earth wouldn't be the same without capturing some fun and memorable photos. I've got a list of my top 10+ places at Disneyland! The search for the perfect Elena of Avalor costume! I always start the search for our Halloween costumes early in September and with my girls birthday in the same month I thought we would try something different and have a costume that could work for both occasions this year.